Of course Louisiana irises grow wild in the wilds of Louisiana! Especially in south Louisiana: in fact, they grow in the ditches down south. Not many grow wild in the northwestern part of the state, though. Several years ago a dear friend who lived in north Shreveport, LA, very near Cross Lake, called to tell me she had found some Louisiana irises growing in the wild in the backwaters of Cross Lake. Cross Lake is a man-made lake that supplies the water for the city of Shreveport. Sue and I put on our boots and joined our friend Lin Millar and we went deep into the woods behind her home into an area of overflow for the lake. It appears to have been an old home site at one time. We found many Louisiana irises blooming in the marshy lowlands. 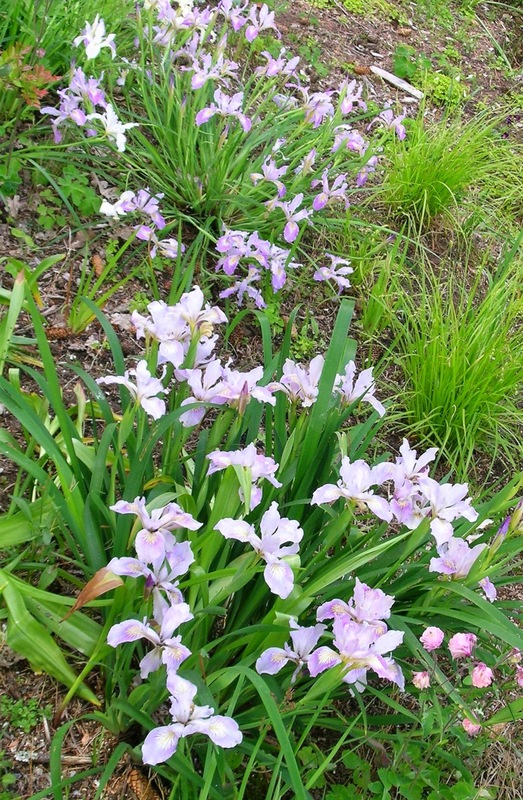 Most of them appeared to be species irises as the blooms were not as large or well developed as most hybrid Louisiana irises. We found many different colors but none of us are scientists so we were not able to determine if they are species or if so, which ones. All of these irises were growing in areas that were either still standing in water or that would have been in water when the lake was higher. Almost all of them were growing in very shaded areas that would have given them very little sunshine. This probably explains why most of them had few blooms per bloom stalk. We carefully collected samples of each of the irises we found and took them back to Lin's garden and to our gardens in Mooringsport, LA. I now grow them in a large bed labeled "Cross Lake Irises". They are doing fine in their new location. Lin visited the area a couple of years later and the whole area had been clear cut and plowed up as though someone was getting ready to build a home there. When collecting irises growing in the wild we must certainly be careful to leave more than we take. In this case, it is certainly a good thing we collected some of each as they are now gone! Some of our readers may be able to classify these irises from the pictures but it is beyond my ability. I know that these pictures prove that Louisiana irises are pretty hardy and will grow in undergrowth, bushes and without full sunlight. This was an exceptionally beautiful specimen with a great color. The above picture shows an area in which the irises were growing well although they were quite removed from the lake edge. These were receiving more sunlight than most we found. This is another area that was at least 50 feet from the lake edge and thick with weeds and grass. More irises growing in the lake's edge in an area that is very swampy and a perfect place for snake watching. This was found very close nearby so it appears the area once had a home. 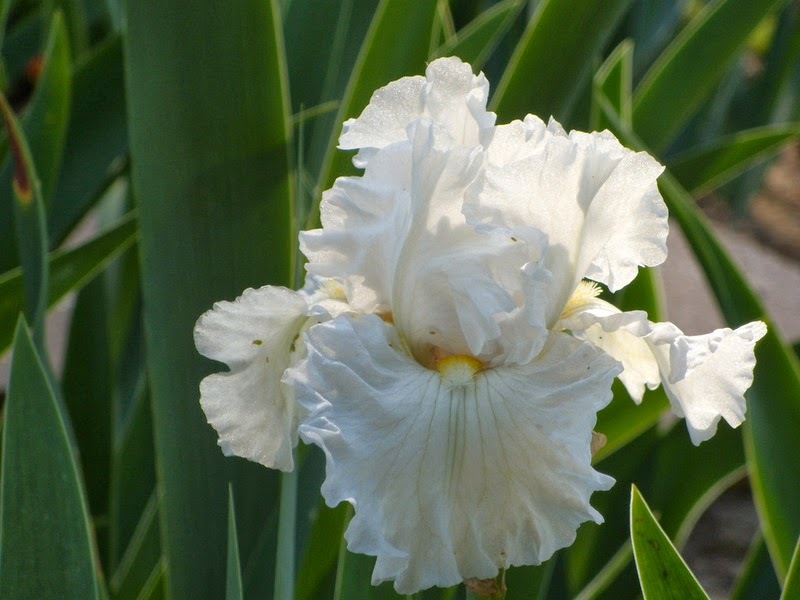 There were many people growing Louisiana irises in their gardens in the Shreveport area in the 40's and 50's, so I believe these irises were either planted in the area or escaped from other gardens around Cross Lake. They may even be from seeds from irises grown in gardens around the lake. We used to cut off all the seed pods from our thousands of Louisiana irises and throw them into Caddo Lake hoping they would take root on the side of the lake. Do you know of a spot where irises grow wild? Perhaps a nearby cemetery, or an old abandoned farmstead? If you would like to learn more about Louisiana irises you can visit the Society for Louisiana Irises, and more about all species of irises is available at the website of The American Iris Society. 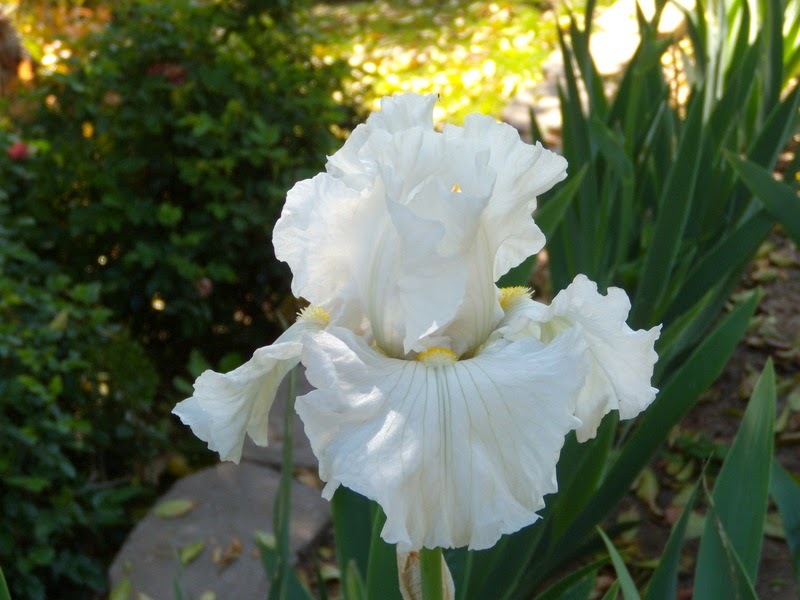 'Lunar Whitewash' is my favorite reblooming iris introduced by Sterling Innerst. It blooms fairly early in the fall and the bloom is beautiful. In 2011 there were seven clumps of 'Lunar Whitewash' all blooming at the same time. Gorgeous! One of my most exciting crosses in the past few years has been 'Lunar Whitewash' x 'Romantic Evening.' This cross gave delightful seedlings with beautiful blooms. I've seen a number of the next generation and they are beautiful seedlings in shades of red, royal purple, white and yellow. Sadly, none rebloom and only one has good branching. Many years ago I was told that 'San Leandro' would give poor branching. This was by a hybridizer that worked with it extensively. I can only suspect that its presence in the parentage of 'Lunar Whitewash' could be a factor in why my seedlings had poor branching. My training tells me to use it as a pollen parent to minimize this effect, although I'm not sure this is a cure. For your own pleasure and a bit of the warm fuzzies, cross 'Lunar Whitewash' with something pretty and just enjoy the children. Don't look at the branching and don't worry about the rebloom. If you worry too much you might lose out on the fun! 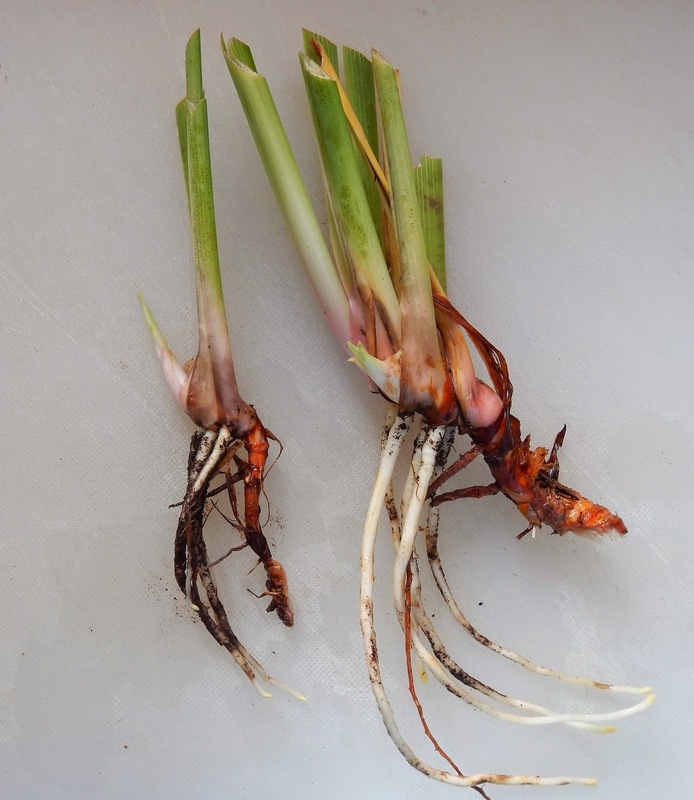 Pacific Coast Iris (PCI) can be so touchy to lift and transplant that gardeners may wait years––letting a particularly choice plant increase in size so that half or more of the clump can be left alone, just in case it really doesn't want to be moved. Translate 'doesn't want to be moved' as 'dies' and you have a pretty good idea of the PCI response to conditions or changes in conditions that it doesn't like. PCI aren't easy plants. They are a good challenge to a gardener's skill set, in a rock gardening sort of a way. The payoff is that when they thrive, the flower show is amazing, and unparalleled in the iris world. I have a pale yellow PCI seedling in my garden that I left to grow an additional year, just in case it doesn't take well to being divided and replanted. I'm waiting this spring to see how it responded to being moved last fall. If it survives, no, if it thrives, then I'll be sending plants out to several growers to see how it does in other gardens. It has many marks of a new and desirable hybrid, and the flowers are nicely complex, with a delicate turquoise flush, golden yellow signal and reddish veins, an open and upright flower, a sturdy base of leaves and strong shoots. The current test is to see how it transplants; desirable PCI seedlings often fail at this test. This seedling PCI last year had lovely flowers with golden signals, reddish veins and a turquoise flush on the falls. This year, I dug it up, divided it, and moved it. Will it thrive? We'll know in a few months. Photo by Kathleen Sayce. Choosing when to divide and transplant PCI can be funny to watch from outside the garden. The gardener pulls soil and mulch away from the base of the plant, looks closely, shakes her head, pats the materials back in place, then moves over to check the next plant, then the next... then goes away for a few days or a week. Or two weeks. Or a month. We are looking each time for that clear sign of a growing PCI–-live white roots on the base of the leafy shoots. Live roots grow twice a year, in spring and fall. In cool moist climates, new roots can grow for several months, almost year round, while in climates with prolonged dry summers, they might grow for only a few weeks: 6-8 at most in fall and spring, with cold weather slowing growth midwinter, and dryness slowing growth midsummer. Why this spring and fall root growth pattern? PCI are native to the West Coast of North America, which has a Mediterranean-type climate. This means that there is a brief to very prolonged dry season each summer, depending on latitude, when PCI go summer dormant. When rains return in the fall, they produce tiny new fans of leaves with tiny buds of roots; and older roots just behind them, on the current year's fan, start growing again. The new fans elongate in late winter and spring, and shoots emerge to bloom in early spring to early summer, depending on latitude and climate. In late spring to summer, PCI set seed, and go dormant for the balance of the summer season. They awaken in fall with the onset of cooler temperatures and rain, producing new roots and tiny new fans. Nurseries know this, and depending on where each is located, aim to ship plants when their roots are growing strongly. This is most often in the fall. For gardeners accustomed to shopping for new flowers by seeing flowering plants at a nursery, and taking them home, this delay can be frustratingly long. Patience is everything in a garden. Growing PCI is a study in patience. You see the plant. You find a nursery that sells that plant, and place an order. You wait. That fall, or the next, it arrives, and you plant it, and you wait. Perhaps it dies––these are PCI we are discussing, after all. So you try again. When it flowers, you see that it's the plant you sought. Or not. And you try again. But what a reward with success. Juno hybrids with Iris sindjarensis? Iris 'Blue Warlsind' a hybrid "Juno" between I. warleyensis and I. sindjarensis, or is it? Between name changes and poor notes it's a bit of a mystery. I. warleyensis is fairly certain as the pod parent. I. sindjarensis, the pollen parent, has had a name change to I. aucheri. Except for being a "Juno" it has little in common with I. aucheri. It does however reflect the traits of I. bucharica. This is an old hybrid and will likely remain a mystery unless someone repeats the cross to determine one way or the other. Iris 'Blue Warlsind' above and below. Thought to share the same parentage as 'Blue Warlsind' is 'Warlsind' another early hybrid. These have been in the bulb trade for many, many, decades. We don't even know the name of the hybridizer. Iris 'Warlsind' above and below. And just for fun is another cross, this time between I. sindjarensis and I. persica. The pod parent is thought to actually be I. aucheri, don't forget the name change. 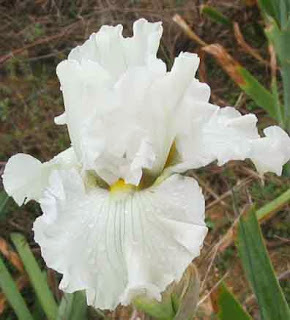 Iris 'Sind-Pers' does have an introduction date 1889, and the hybridizer was Van Tubergen. This is an easy to grow hybrid and in good soil can make a nice sized plant in only a year. It is very short and the flowers create a fine bouquet appearing to all come from the center of the clump. Iris 'Sind-Pers' above and below. These are all very early flowering irises and want very good drainage, I grow them like Aril irises. In my Kansas City garden they bloom near the Vernal Equinox. 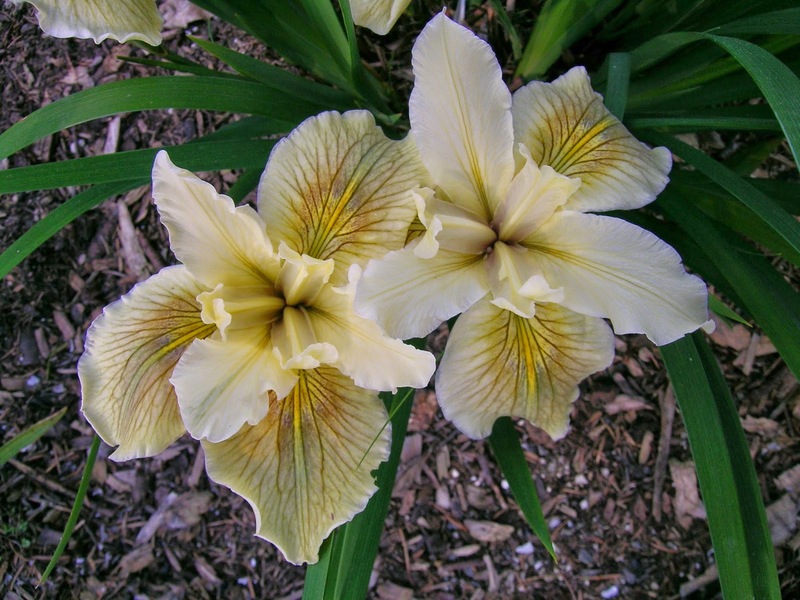 When browsing through the Fall bulb catalogs look for and give Juno Iris a try. They make a great start to the Iris Season.